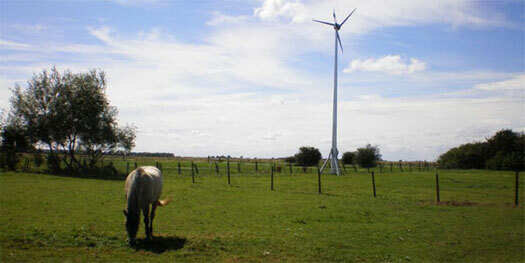 On Wednesday, 18 July 2012 our Wind Turbine was connected and now we are proudly running on Green Energy – power from the Wind. (Something Lincolnshire definitely has a lot of!). Surprisingly the ponies are not bothered by having a turbine in their field, it is very quiet, and Nevis and Fiddich have looked at it hopefully as another interesting post to rub their tails on. This entry was posted on August 2, 2012	and is filed under About us. You can follow any responses to this entry through the RSS 2.0 feed. Both comments and pings are currently closed.